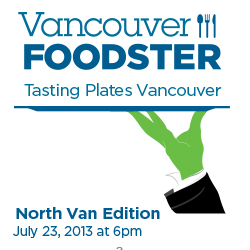 Here we go again, with another Tasting Plates presented by Vancouver Foodster. 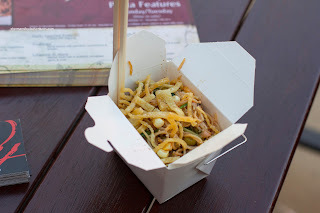 I was invited along with some other bloggers to sample the food that Lower Lonsdale in North Van had to offer. Unlike previous events, all of the restaurants were located within a 2-block radius which meant that no vehicle nor public transit was needed. We just had to walk to each destination. 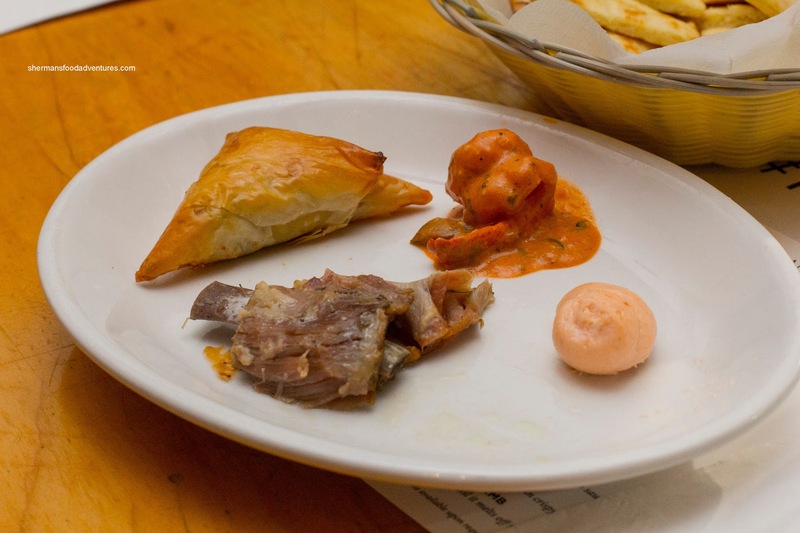 For those unfamiliar with Tasting Plates, it is a self-guided food tour of sorts where one visits different restaurants trying out a dish or two for one ticketed price. Viv and I met up with Sean and Curtis at the starting location - Cafe for Contemporary Art. We were served a choice of tacos including A la Vida or Rhonda-Maria and a choice of drink from either the Thai Iced Latte or Hibiscus Iced Tea. We ended up sharing them and believe it or not, I actually preferred the Rhonda- Maria consisting of spicy roasted yam, pumpkin mole, goat feta, habanero mango salsa, guacamole and lettuce. Yes, the one without meat, shocking isn't it? 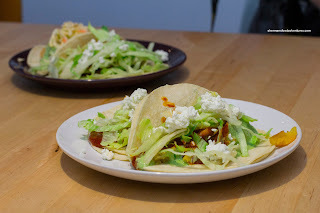 Well, it was fulfilling due to the myriad of flavours including the sweetness of the yam, heat from the salsa and the cooling effect from the feta and guacamole. It wasn't as if I didn't enjoy the A la Vida (panko-breaded basa, salsa roja, pumpkin mole, guacamole, onions & cilantro and creamy coleslaw), but it was less impactful in terms of flavour. I mostly got cilantro and the crunch from the ample coleslaw. The fish was moist, but not particularly crunchy. 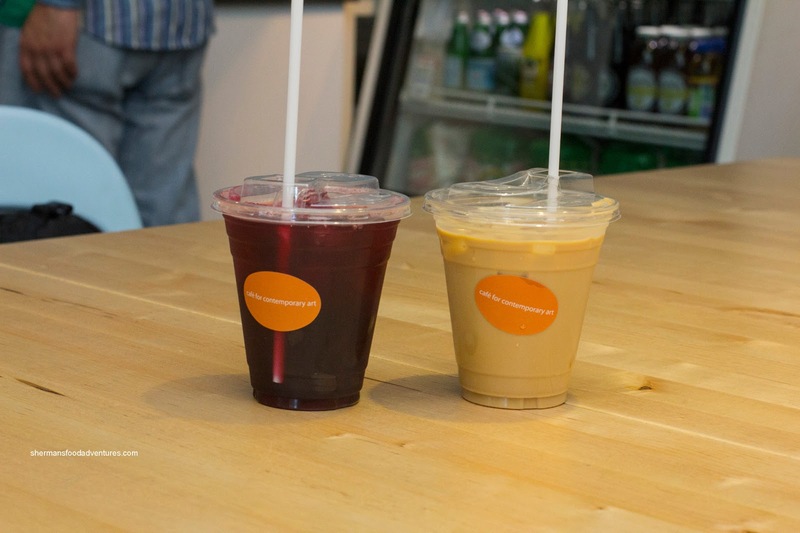 As for the drinks, I liked both as they were not overly sweet. The Thai Iced Latte (espresso, whole milk, sweetened condensed milk, cardamom and kaffir lime leaf-infusion) was light while still exhibiting some body. As mentioned, it wasn't sweet and had just the right amount of dairy (not too heavy). The Hibiscus Iced Tea was refreshing with a slight bite. After this, we were already pretty satisfied, but realized there were 6 more stops! We made the short stroll up to Fishworks for 2 freshly-shucked Oysters that were dressed with a shallot mignonette which provided the right amount of sweetness and acidity to highlight the sweet flesh. Then we got a little confused as to our next location which was El Matador. The address said Esplanade, but it really was in the alley behind it. 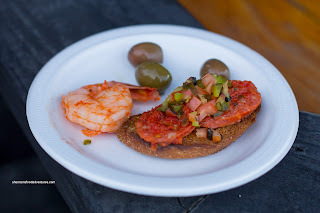 Once there, we were presented with a plate consisting of Chorizo Tapas and Spicy Shrimp Pinxo. I liked the sweet snap of the shrimp which was accented by a slow rumble of spice. The chorizo was presented atop light and crispy bread. The sausage was meaty, moist and spicy. Swinging around back up Lonsdale, we headed to Gusto di Quattro next and sampled their interesting and whimsical Ori-talian-inspired Noodle Salad with roasted tomatoes, capers balsamic & pickled vegetables with crispy Parmesan wontons strips. Although made with predominantly Mediterranean ingredients, it did its best impression of an Asian cold noodle salad. I particularly loved the fresh sweet corn which provided both texture and sweetness. Heading over next door to Anatoli Souvlaki, we were presented with a plate of Braised Country Lamb, Prawns in Tomato Feta Ouzo Sauce, Spanakopita and Pita with Taramosalata (Greek caviar). Although the lamb was tender, it was a touch dry and lacking in recognizable seasoning. But the prawn was pretty good with a firm snap and plenty of creamy tomatoness and a hit of licorice. The spanakopita was light (yet greasy) and filled with feta and spinach. Surprisingly, I loved the tart taramosalata spread on the toasted pita the most. Once again going practically next door, we visited The District. We were given a choice between plain Frites, ketchup or garlic mayo. We all had garlic mayo except for Viv. 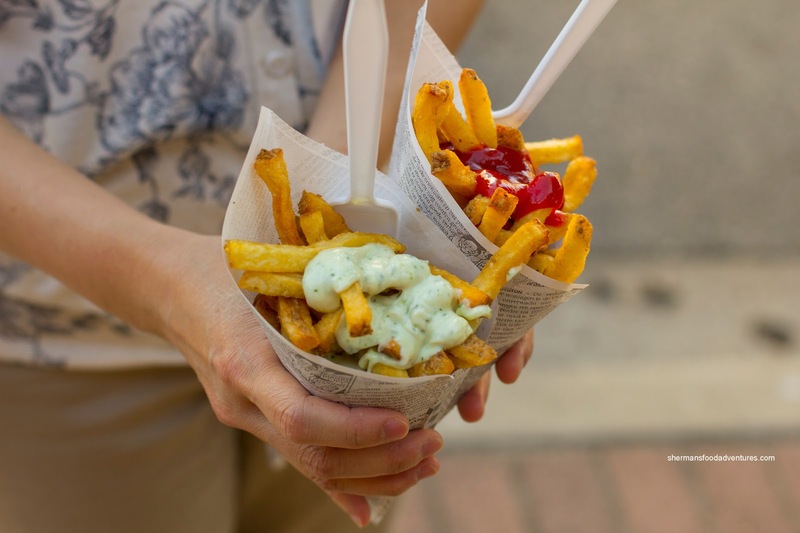 I found the frites to be very good with a wonderful golden brown exterior and crunch. The garlic mayo was light and creamy with plenty of garlic flavour. Lastly, we made our way to Pier 7 and their offering of Tuna Gomae, West Coast Oyster with horseradish & mignonette and Herb Marinated Prawn with basil crema. We got a small Sangria on the side as well. The tuna was seared nicely and it was not bad. I could've used more sesame though. 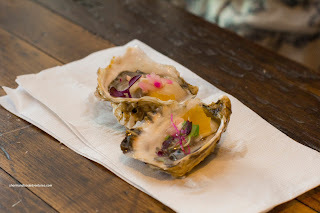 The oyster was huge and naturally sweet. 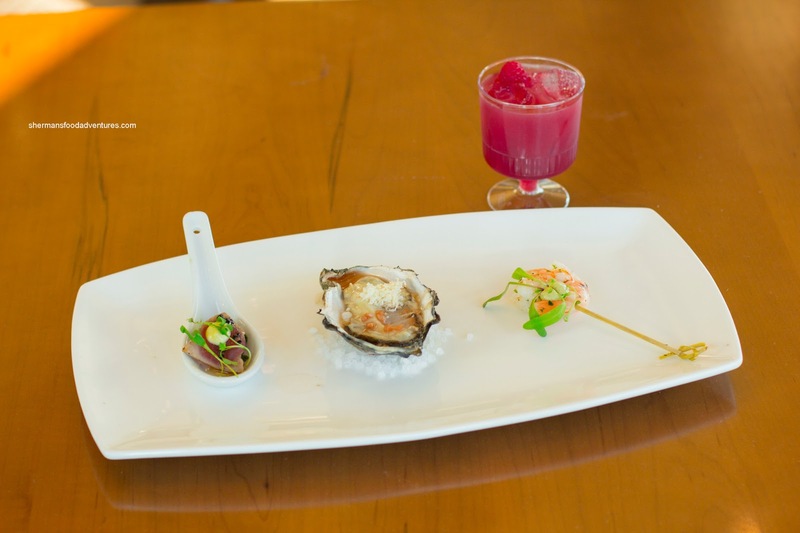 For me, it was good, but for the others, there was very little mignonette. The prawn had a nice snap but was curiously bland. Once again, this was a nice way to check out various restaurants in a particular area for a reasonable $35.00 per person. 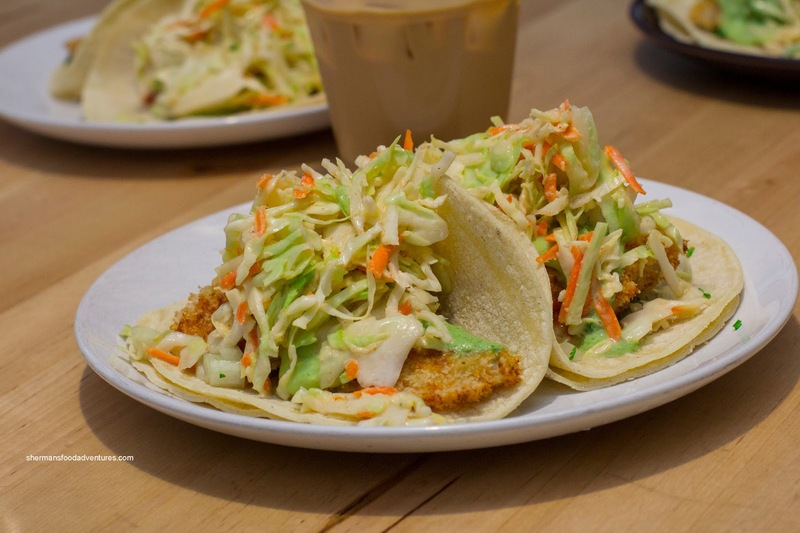 Whats the name of the restaurant that you had the rhonda maria tacos? They sound delish! @Gloria Tsang Oh, the first place, Cafe for Contemporary Art.